If you recall, I ordered some Bacon Hot Sauce. Well, it arrived last week and I set to work trying it out. Upon opening and smelling the bottle, my first impression was that it smelled bacon-y, but not quite entirely like bacon. It was an odd smell, but not unpleasant. Kind of like if you combined traditional cayenne hot sauce with some liquid smoke. Fingertip taste revealed that it is crazy salty and with a nice heat that creeps up on you. Still not really impressed with the bacon flavor, but it is definitely smoky. I decided to try it on my dinner, since I like hot sauce on my broccoli. Yeah, I know, it's weird. I usually use sriracha, but opted for the Bacon Hot Sauce instead. Okay. DO NOT TRY THIS. You know when you were a kid and you'd go to the petting zoo/farm? You know what the goat enclosure smelled like? Imagine eating broccoli that tasted like that smell. Ugh. Not good. So we can say that Bacon Hot Sauce is NOT good on broccoli. Next try was on scrambled eggs. Not too bad - but once again it tasted like liquid smoke mixed with regular cayenne hot sauce. The heat is a nice creeping heat so you really get the flavor, I just wish the flavor was more like bacon. I mixed some in the barbeque sauce that my husband put on his hot wings that night. He said they were good. No comment on them being especially hot or bacon-y, though. I drizzled a bit on some french fries. The bacon flavor seemed to come out a bit more when combined with potatoes. I gave up on experimenting after that and just decided that Bacon Hot Sauce is good on potatoes. Final verdict? 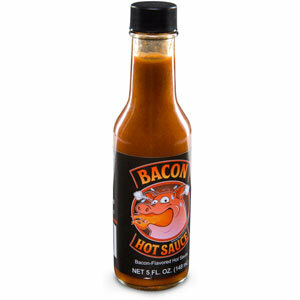 It's interesting and a tasty hot sauce, but don't expect OMG BACON out of it. If shipping were cheaper or you can find it locally for six bucks, I'd say go for it for the novelty factor. Just do NOT put it on broccoli.